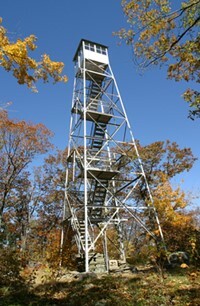 On your fall adventures, visit the recently-restored Jackie Jones Fire Tower in Harriman State Park. The Trail Conference and the Palisades Interstate Park Commission are proud to present a series of open days to the recently-restored Jackie Jones Fire Tower in Harriman State Park. Visitors are invited to explore this historic fire tower on Saturday, October 13, 20 and 27 between 10 a.m. and 4 p.m. Chat with a Park Ranger and Trail Steward about the history of the tower, the recent restoration work, and backcountry hiking practices.